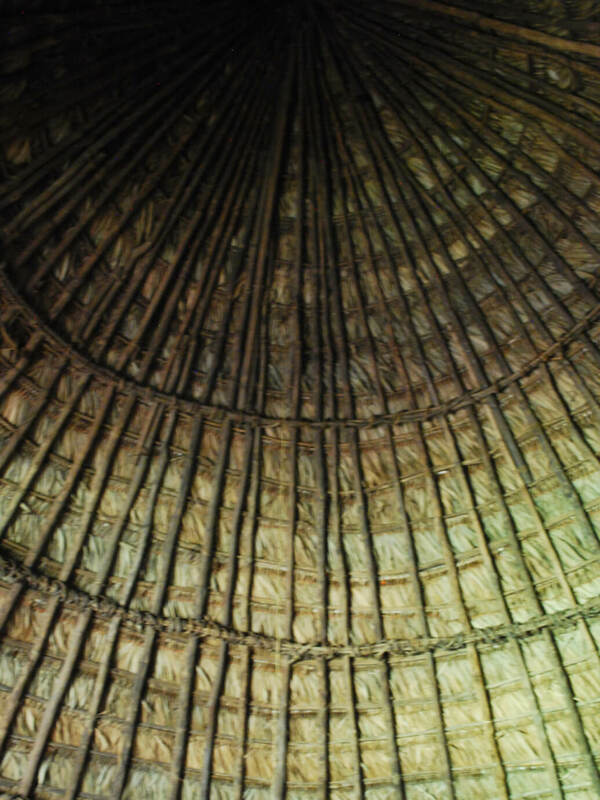 In order to discuss ‘travelling concepts’ in indigenous architecture, the latter’s characteristics will be introduced with an overview of indigenous building traditions in Central America, focusing on the eight remaining indigenous peoples of Costa Rica: Ngöbe, Bribri, Cabécar, Boruca, Térraba, Huetar, Maleku, and Chorotega. An in-depth comparative investigation into architectural cultures in Central America reveals various independent and unique building types and traditions, as well as similarities in basic principles and symbolism. 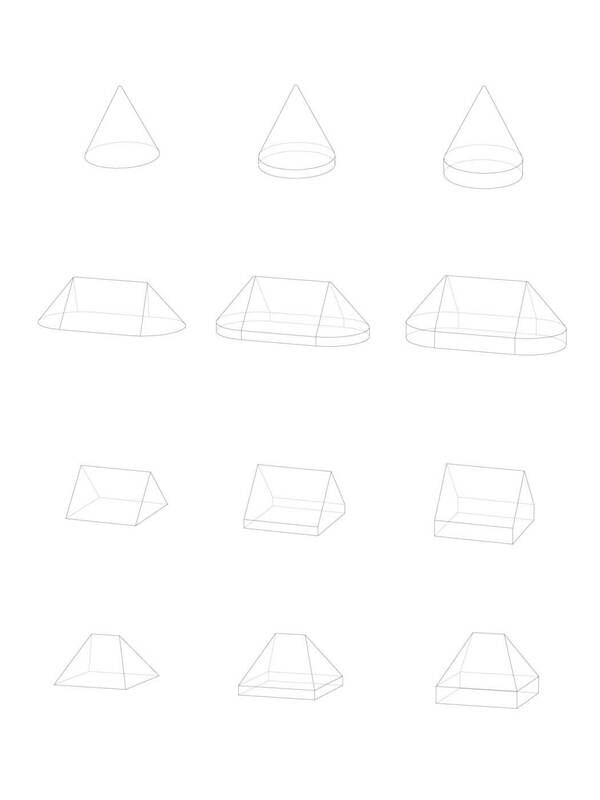 The analyzed architectural traditions show the independent development of ground floor shapes, structures, materiality, ceremonies, and symbolism, articulated in different basic shapes, deriving from round, oval, and rectangular ground plots with various roof constructions and three-dimensional projections (see fig. 1). 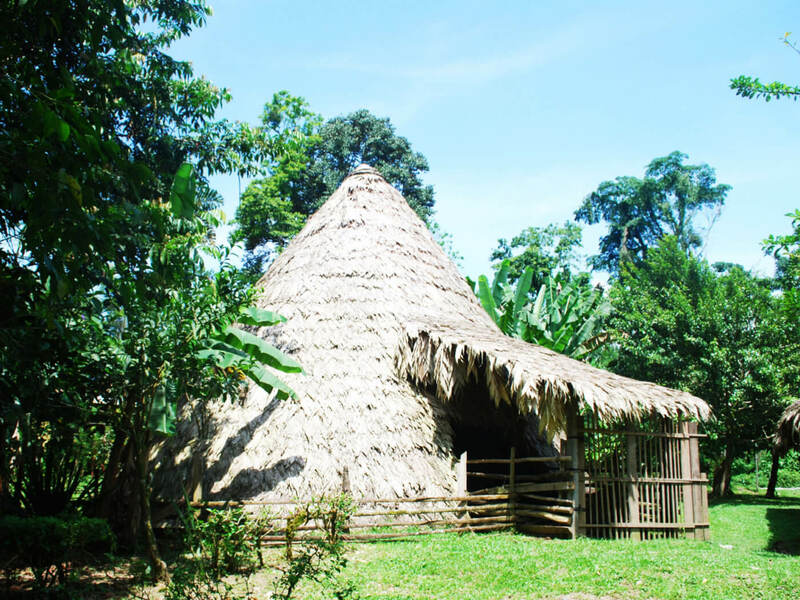 In addition to similarities in the buildings’ surroundings, nature, and materiality, which are typical for indigenous cultures,  various local, independent architectural expressions between and within the indigenous cultures were found. 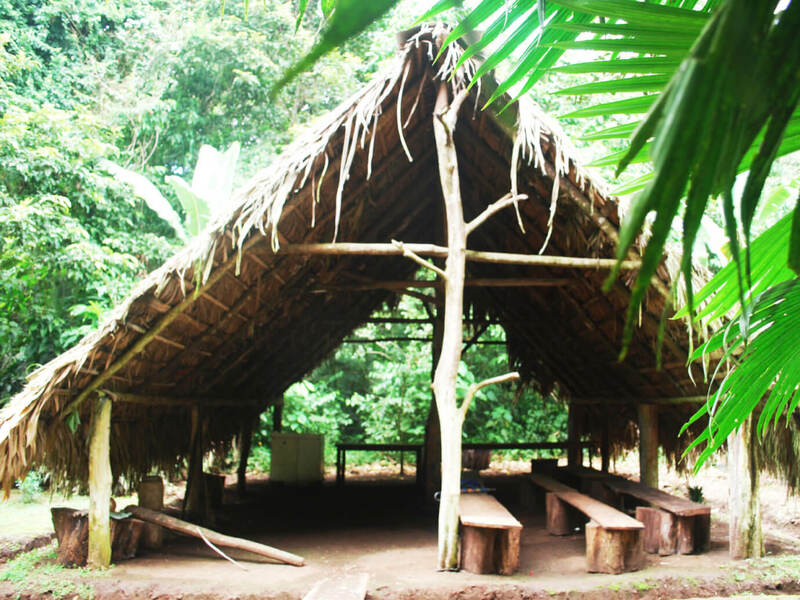 While, in some cultures, one type of building serves all functions, as it does, for instance, for the Maleku in Costa Rica (see fig. 15), other traditions use different types of buildings for particular activities, some with a very specific purpose, like a birthing or sepulture house. 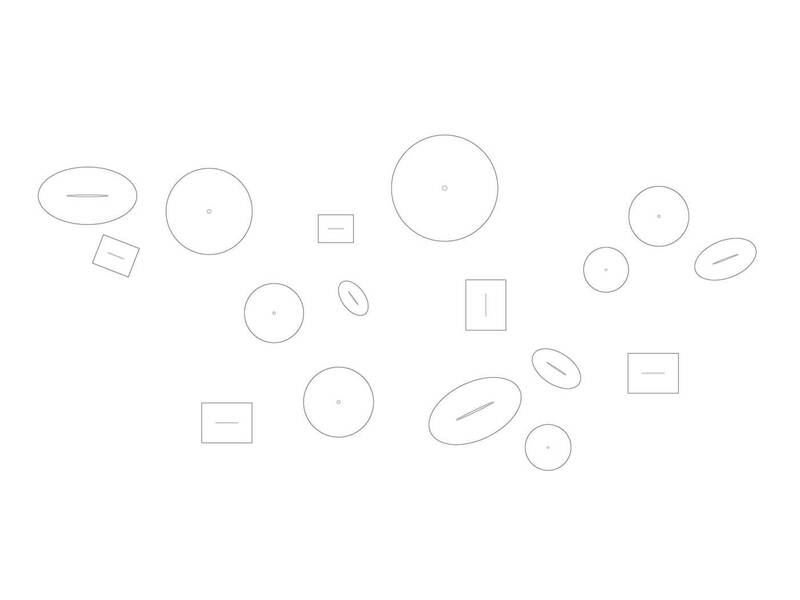 The sensitive translation of symbolism into built expressions differs greatly and can be seen, for example, in a comparison of different types of round buildings. The most important buildings of three ethnic groups in Costa Rica, the Ù sulë́  of the Bribri (see fig. 2), the Jutsinín of the Cabécar, and the Ju Dogwabti of the Ngöbe, for instance, differ in important principles and are expressed through different three-dimensional figures and details. While all three buildings focus on the representation of the center, this symbolism is realized differently in each tradition: a conical space without a supporting structure in the center and a cord in the Ù sulë́,a pronounced round structure, traditionally without central support, in the Jutsinín, and a rod-like column in the Ju Dogwabti (see fig. 7). 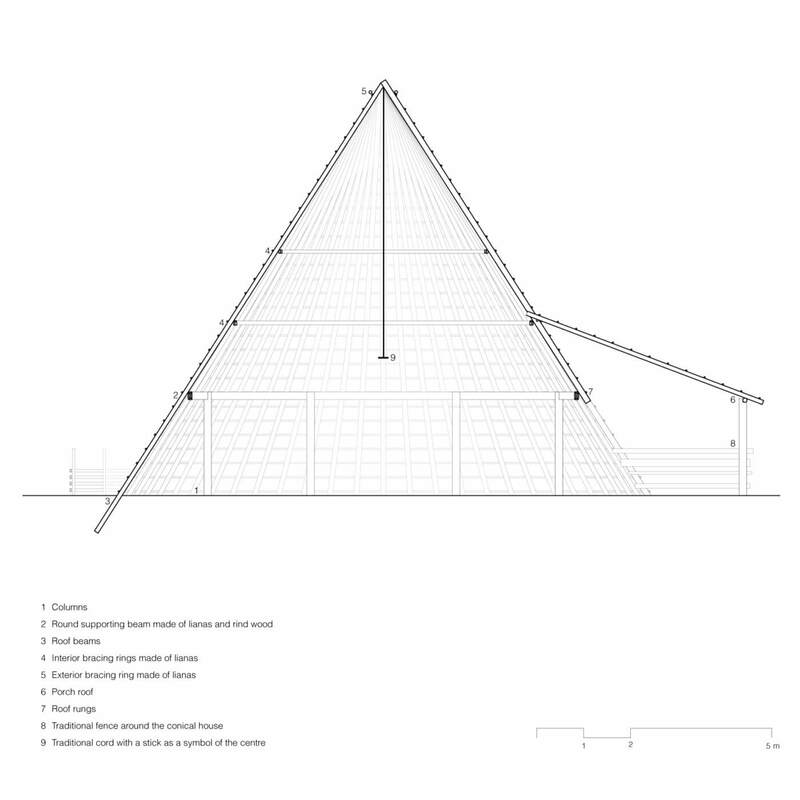 To contrast this typological approach, the next section moves away from visual analysis and focuses on the content of diverse imported issues, a common factor in indigenous architecture. 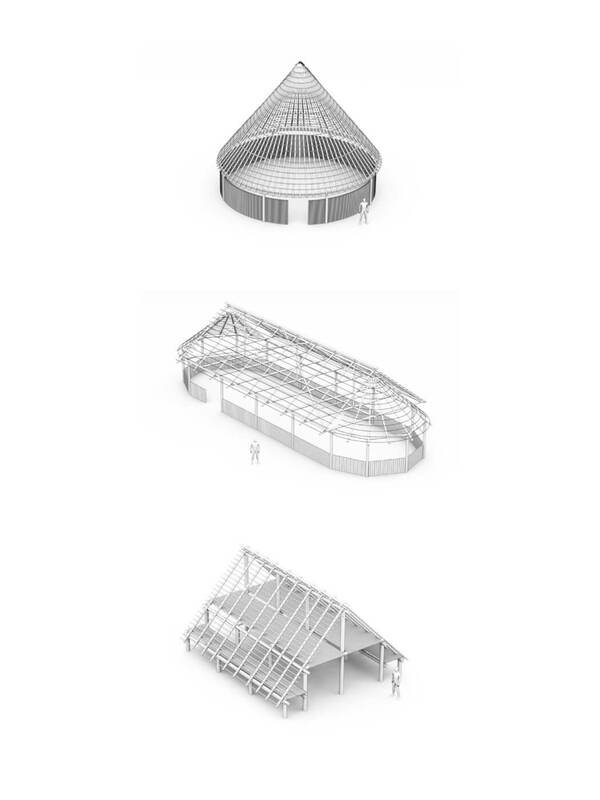 As well as visual similarities and divergences, the indigenous cultures investigated here show parallels in how they represent abstract concepts in architecture. These strategies are contrasted with selected examples from Mieke Bal’s book Travelling Concepts. According to Mieke Bal,  the concept of an image renders the meaning of its content, similar to a text. Instead of simply producing a casual label, the concept expresses an understanding within a context, comparable to the substructure of syntax and decipherable through its components. How a meaning can be made readable through an image can be perceived, for instance, in the round Ù sulë́,the most important type of building in the Bribriculture. The building is characterized by a conical structure that reaches into the ground like a roof house. The interior supporting structure is made up of a round beam that distributes the weight of the roof onto eight columns, with two additional interior bracing rings and one exterior bracing ring at the top, which secures the vegetal roof from the outside (see figures 8 and 9). 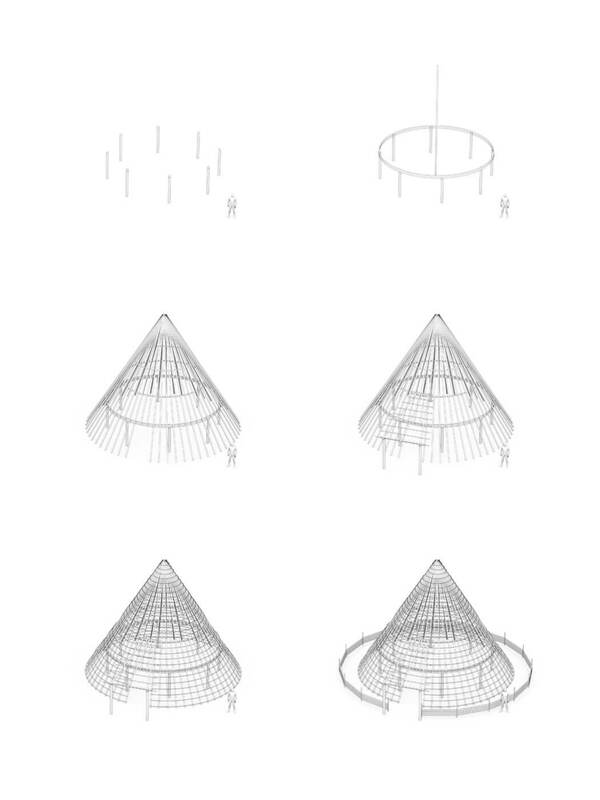 In addition to the direct, simple image of the building as a reproduction of the world through its four structural supporting rings, the conical house also creates profound images that connect it to the Bribri’s cosmovision, and which reflect the strong connection between the conical houses and the inhabitants. Both the idea of a world with four levels and the traditional belief in the four parts of a human being are conveyed by the house and its construction by making the observer and builder reflect on their own existence. During the building process, a virtual existence of two worlds is created through, for example, the builder’s awareness of life and afterlife. The construction process of the Ù sulë́ follows specific, strict rules and is remembered by the Bribri through stories about the construction of the world. 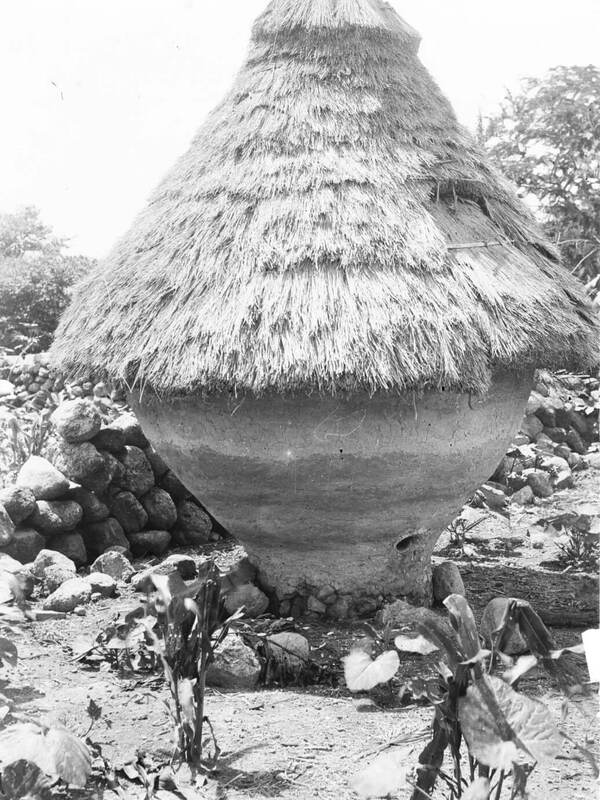 Over several months, the village or family build the conical house, remembering the different narrations, passing through different stages. Due to its vegetal materiality, the house will continue to age after its completion and will be rebuilt once its structure has been undone by nature. This construction therefore stages the life cycle as well as the afterlife, and creates through a kind of experienced learning process an idea of a second life in the observer. The construction of the four structural segments of the house recalls different stages of life and therefore also presents an image of the four characters of an individual in the Bribri tradition. Through its structural division into four parts and its period of use, the house translates life and frames the house not as an object, but as a first person. Converted into an image of life and the human being, the house achieves a virtuality of the Bribri’s belief and their stories, in which the house is referred to as a person. The Cabécar culture in Costa Rica integrates a similar image into its architecture, though it is expressed differently. Despite a similar perception of the world, life is staged through additional means and can be observed, for instance, in their oval houses. Traditionally, this type of building was erected with four levels, with each floor intended for a different generation, the youngest on top. This separation of generations and the individuals’ passing through different levels of the house as they get older creates a virtual image of the life cycle and multiple characters of the human being, as well as of their cosmovision, in which every level is inhabited by a specific being or by a different generation of their creator’s family. The Ù sulë́ also metaphorizes the human life cycle by its manipulation of light. To the Bribri tradition, the importance of light and darkness increases with the significance of the type of building and is expressed by a shaded space and the absence of additional openings. As a building of prime importance, the Ù sulë́’s extreme darkness is mandatory, referring to the Bribri’s stories about the creation of the world (see fig. 11). Fig. 11: Darkness inside the Bribri conical house, Costa Rica. | Image: Verena Tochtermann. The drastic difference between the obscurity inside and the tropical sunlight outside the building is intended to remind the Bribriof the moment of darkness on the earth and the creation of life. These gradients of light, as well as the act of passing through the building, therefore represent an image of birth and death, which could also be read as a narrative or mise-en-scène of their stories. The narrow opening in the entrance and the passing from the dark into the brightness of day evokes the experience of birth, and is thereby also reminiscent of the creation of the earth and humanity. The house is thus converted into an image of Bribri history, a builder of history. The contrast between light and dark suggests not only a dichotomy of life and death, but also positive and negative, good and bad, which are also reflected in the Bribri’s beliefs. The building’s ambiguity reflects the Bribri perception of humankind, according to which every person has both good and bad aspects, and reinforces the metaphor of a building as a person. Most indigenous cultures value a close relation between nature and architecture, though this translates into different concrete forms. The meaning of this characteristic can, for instance, be shown in the building Ölö̀we,the second most prominent building in Bribri culture. 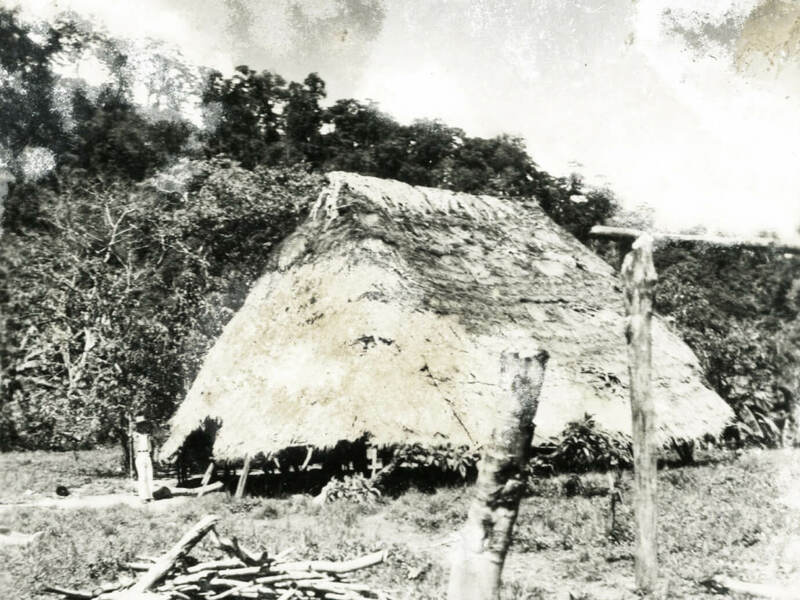 Although its symbolic meaning is not as pronounced as that of the conical building, it is perceived by the inhabitants as an image, in the sense of a replica, of the surrounding ridge of the Talamanca mountains that cross the south of Costa Rica (see fig. 12). In its three-dimensional construction, the building creates a visual reprint of the mountains. But it also mirrors its surroundings with other principles and, in addition, transmits and metaphorizes them by its materiality. Although the different types of Bribri buildings are typically made of specific types of wood and plants, the oval houses correspond to the round building types in their vegetative nature, changing and decomposing, only to be rebuilt after several decades. Through this aging process, the building takes on the status of a first person, mirroring the surrounding landscape, its life cycle, and its changes in a metaphorical way. With its changing appearance, the house enacts the passing from one life into another. Its regular cycle of reconstruction, in particular, recalls the human life cycle and functions as a reflecting and learning instrument that interacts with the user of the building by addressing the inhabitants directly during the construction process. The effects of mise-en-scène as a concept can, for example, be seen in the analysis of the urban settlements in the Cabécarculture of Costa Rica. 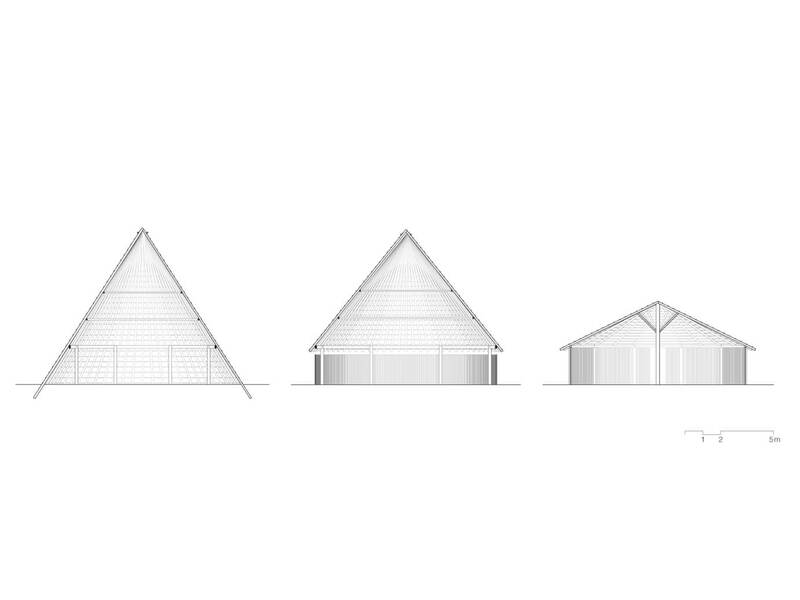 The Cabécar traditionally combine three basic typologies in their settlements: round, oval, and rectangular buildings (see fig. 13 and 14). While the rectangular buildings occupy a less significant and more functional role, the other two types contain important symbolic content and should, according to cultural tradition, be built next to each other. In contrast to the rectangular buildings, which are built for specific, functional uses only and can therefore take different three-dimensional concretizations, the construction of the round and the oval types represent a mandatory task: In the Cabécar culture, a village or family should erect at least one Jutsinín, their round house and most important building, and one oval building side by side. The two buildings’ prominence is also grounded in their narrations, where the round house symbolizes a male character and the oval building a female one. While the assignment of gender to a building is the result of a visual deduction of forms, the special arrangement in groups also produces meaningful content that is not created by the gender status or symbol of the house. The grouping implies a communication between the building types in an abstract manner; it emphasizes the differences between the basic typologies and generates a communication between them, turning them into subjects. It stages outside and inside, private and public, but in Cabécar belief, also different kind of beings. By perceiving the two building types next to each other, the empty space between them stands out and shifts them from objectivity into subjectivity. Only in this contrast does the prominence of the round building among other buildings reveal itself and makes the observer perceive it as the lean character and the most important building of the constellation. In dialogue with other types, the round building is framed, put into a more significant position and subjectified by the communication. Among the indigenous cultures of Costa Rica, the Maleku represent unique, individual traditions. Both their constructions and the conceptual contents with which they endow them differ significantly from those of the other indigenous groups. In contrast to cultures with various types of houses, the Maleku house different tasks and functions within a single type of building. 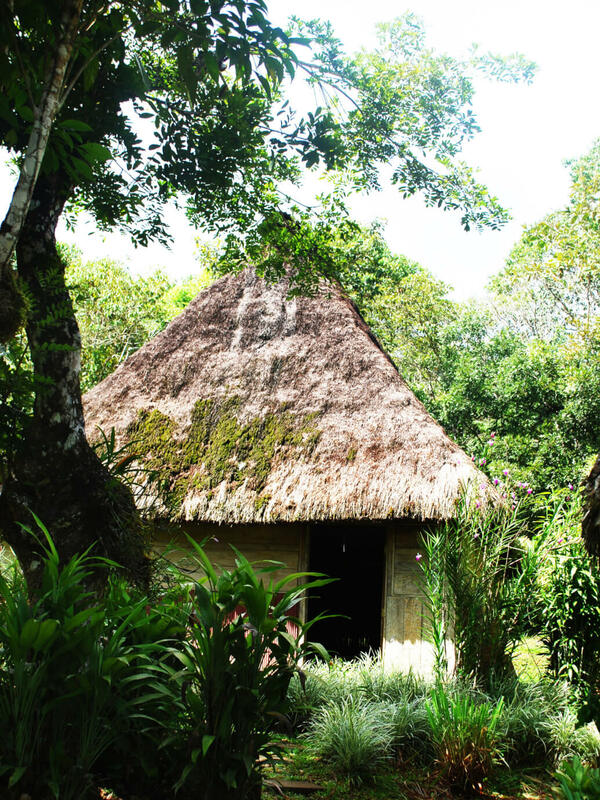 The traditional Maleku construction is a simple, rectangular building with a rigged roof and a completely open ground floor (see fig. 15). The traditional placement of the sepulture illustrates a theatrical peculiarity of the Maleku house. The Maleku used to bury their dead relatives inside these buildings, and attributed great significance to their locations. The sepulture was traditionally surrounded by a low fence that kept the visitors from treading on it, which was considered an offense. By this staging of the invisible, the attention of the visitor to the house is drawn to the afterlife, or the parallel life, present in most of the indigenous cultures examined here. Through its declared and depicted absence, the building stages the invisibility and uncertainty of life, as well as human vulnerability. Trespassing onto a certain architectural element would be understood as a violation of the rules and, consequently, of the human being itself. In many indigenous architectural practices, the construction process marks a moment of reflection and interaction and is often shared with the community. 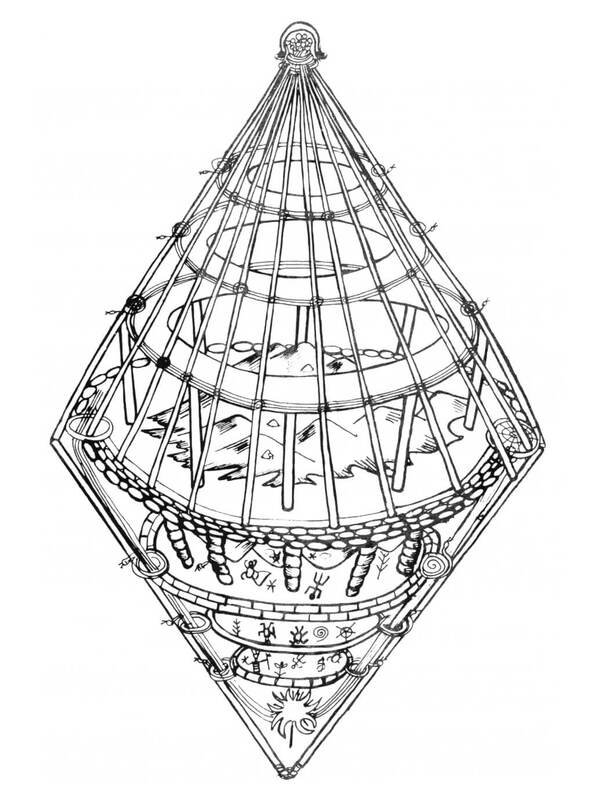 However, the specific rules for each process and their meanings differ greatly, as will be demonstrated using the example of the Bribri conical building (see fig. 16). The construction of a Ù sulë́ usually takes around three months and follows a strict timetable. The work is mostly carried out in a collective, but the procedure and the details, as well as the traditional ceremonies, are organized by the Awá, a highly regarded figure in the community with competence in medicine and construction. Every single detail of the construction process is expressed by narrations of the creation of the world and the human being. They are passed down from generation to generation in an oral tradition. Passing down the traditional stories to younger generations represents a very meaningful job for the Bribri, and only a specially trained person of a certain clan is allowed to do it. During the construction process, the stories of the ancestors and the creation of the world are metaphorically enacted under the guidance of the architect, converting him into the director of a play. Through this peculiar process, the building not only metaphorizes history, but also converts it into a physical experience for the builders. The building turns into a performance of learning itself as an interaction, staged for the perception of all human senses and accompanied by the performance of communal and personal memory. During the three months of construction, the Bribri’s cultural memory and oral heritage is passed down from generation to generation in a collective performance, and history is re-enacted in the present. According to Mieke Bal, intention as a concept is often generalized and characterized by complicated relationships. Since intention has frequently been misused in architecture, this last section focuses on that concept. In architectural practice, the concept of aging — letting a work grow, age, or degrade — has become very popular, whereas in indigenous architecture, the change in a building is a very natural process and can be demonstrated, for example, in the Bribri’s abandonment of their round buildings to time and weather. Due to their vegetal materiality, the buildings change and grow, designed to be built and rebuilt and to make the inhabitants reflect on time, space, and history. Through the constant change in its physical condition and its therefore direct effect to the habitants, the building shifts from the third person to the first person. Though it is designed and intended to change, no one could possibly know how precisely the building is going to change, nor how long it is going to last. While abandoning the building to time and nature is intentional and in accordance with Bribri traditions, a different factor of abandonment, one foreign to architects, is left to the materiality itself. When analyzed through ‘travelling concepts,’ indigenous architecture, wrongly dismissed as ‘primitive,’ presents a dense variety of meaningful content. The essence of indigenous architecture, revealed through ‘travelling concepts,’ contains more than visual or functional solutions; it houses a multiplicity of messages and potential for improvement. 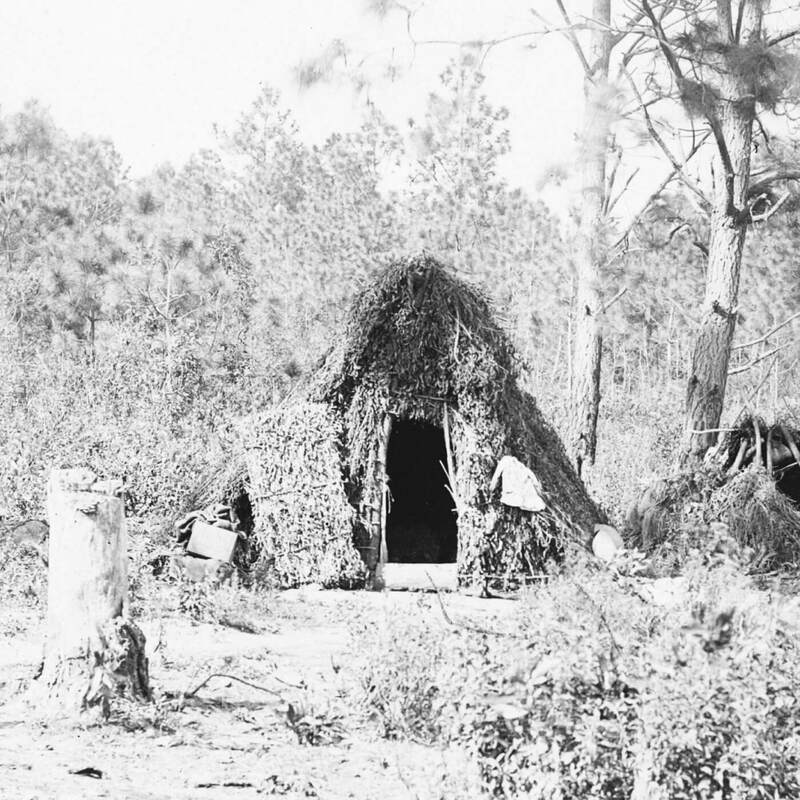 Within the context of architectural discourse, for instance, indigeneity offers new perspectives with which to confront visual hegemony, as well as to overcome the division between vernacular and academic architecture. Although indigenous architecture is not inherently political, it diverges from a variety of current political ideas. 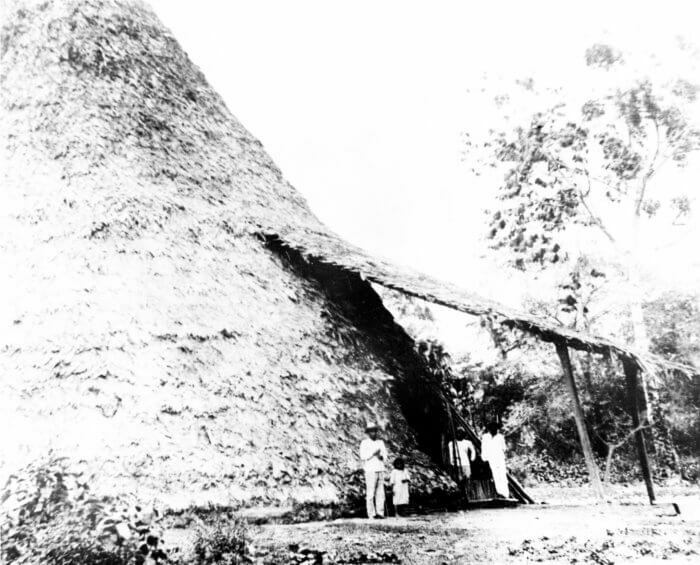 In a context where only the architecture of colonialism is protected,  researching indigenous architecture could not only contribute to an understanding of cultural heritage and preservation, but also free it from what is left of colonialism and secure the protection of indigenous languages, territorial rights, and political self-representation. Due to its particular use of concepts and performance of change, indigenous architecture itself could be perceived as staging Mieke Bal’s idea of ‘travelling concepts,’ and could enhance other disciplines in addition to architectural analysis, particularly fields which are currently struggling with linear methodologies and the separation of object and subject such as philosophy, physics, or other cultural fields, where the analysis and travelling of concepts from indigeneity to their disciplines holds new perspectives. While architecture in general is undergoing a re-examination by philosophy in order to confront challenges like the separation of object and person,  the potential of indigeneity still needs to be unlocked. Verena Tochtermann. “Building New Concepts: Concepts in Indigenous Architecture as an Interdisciplinary Enhancement Factor?” On_Culture: The Open Journal for the Study of Culture 5 (2018). <http://geb.uni-giessen.de/geb/volltexte/2018/13661/>. Verena Tochtermann, Die Architektur der Ureinwohner Costa Ricas: Eine Gegenüberstellung der indigenen Bauformen und deren Kontext (master’s thesis, Technische Universität Wien, 2016), 84. 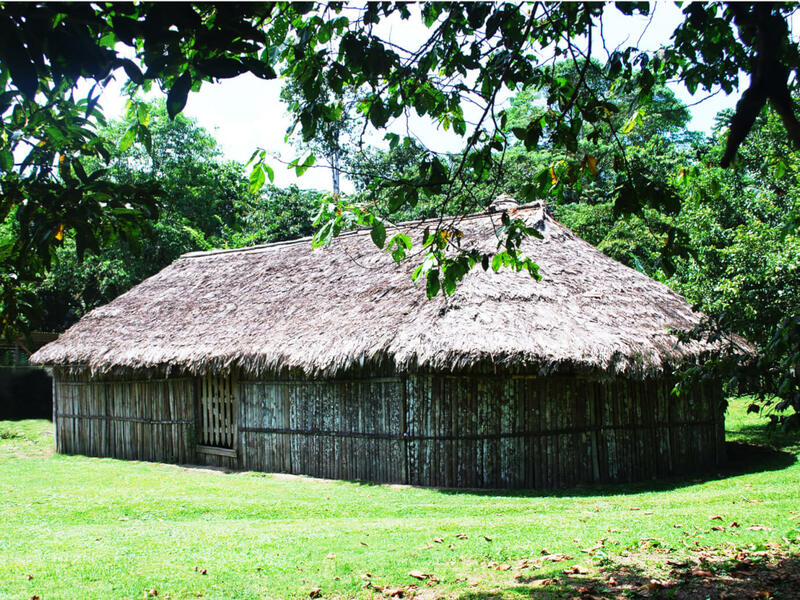 For further information on the architecture of the indigenous peoples of Costa Rica, see Tochtermann, Die Architektur der Ureinwohner Costa Ricas, 83–271, 313.
 lgb 9380, Colección Museo Nacional de Costa Rica. lgb 34933, Colección Museo Nacional de Costa Rica. Tochtermann, Die Architektur der Ureinwohner Costa Ricas, 134. Mexico, Archivo General de la Nación, Fondo Introducción Pública y Bellas Artes, sobre 7, PAL 4259. Mexico, Archivo General de la Nación, Fondo Introducción Pública y Bellas Artes, sobre 2, PAL 4171. Katherine MacDonald and Carlos Hernán Segura, “Arquitectura y clima,” in Habitar 20 (1986), 24. The indigenous terms in this text use a syntax form developed to explain their culture in Spanish, invented together with linguists, since the indigenous cultures didn’t traditionally use writing. For further explanation of the syntax in Bribri, see Victoria Jara Murillo and Alí García Segura, Se’ ttö́ bribri ie: Hablemos en Bribri (San José: Editorial de la Universidad de Costa Rica, 2013). Tochtermann, Die Architektur der Ureinwohner Costa Ricas, 98. Kari Jormakka, Eyes That Do Not See (Weimar: Verlag der Bauhaus-Universität Weimar, 2011), 14, paraphrasing Viktor Shklovsky’s theory of poetic images. See Tzvetan Todorov, Theorie de la litterature: Textes des formalistes russes resuis (Paris: Edition de Seuil, 1966), 56. Jormakka, Eyes That Do Not See, 109, referring to Antti Eskola, Jäykkyys ja taidekäsitykset (Tampere: Yhteiskunnallisen Korkeakoulun Tutkimuslaitos, 1963), 27, 106. Jormakka, Eyes That Do Not See, 97. Jormakka, Eyes That Do Not See, 108, referring to Milton Rokeach, The Open and Closed Mind (New York: Basic Books, 1960), 78–79. Jormakka, Eyes That Do Not See, 109, referring to the Antti Eskola’s rigidity scale in Eskola, Jäykkyys ja taidekäsitykset. I am paraphrasing Juhani Pallasmaa, Los ojos de la piel (Barcelona: Editorial Gustavo Gili, 2006), 10. Pallasmaa, Los ojos de la piel, 9. Bernard Rudofsky, Architects Without Architects: A Short Introduction to Non-Pedigreed Architecture (New York: Museum of Modern Art, 1981 [1st ed. : London: Academy Editions London, 1964]). Francisco Javier López Morales, Arquitectura vernácula en México (México: Editorial Trillas, 1987), 10. Mieke Bal, Travelling Concepts in the Humanities: A Rough Guide (Toronto: University of Toronto Press, 2002), 7. Bal, Travelling Concepts in the Humanities, 44. Bal, Travelling Concepts in the Humanities, 33. The term ‘diffusion’ is borrowed from Isabelle Stengers, D’une science à l’autre: Des concepts nomades (Paris: Editions du Seuil, 1987). Bal, Travelling Concepts in the Humanities, 6. Bal, Travelling Concepts in the Humanities, 22–24. Bal, Travelling Concepts in the Humanities, 51, referring to Gilles Deleuze and Félix Guattari, What is Philosophy? (London: Verso, 1994). Bal, Travelling Concepts in the Humanities, 22–23. The term ‘image,’ as well as the following concepts and denominations, are borrowed from Mieke Bal. For information on the image as concept, see Bal, Travelling Concepts in the Humanities, 56–95. Bal, Travelling Concepts in the Humanities, 26. Tochtermann, Die Architektur der Ureinwohner Costa Ricas, 100. Tochtermann, Die Architektur der Ureinwohner Costa Ricas, 234. For a detailed analysis of the conic building of the Bribri, see Tochtermann, Die Architektur der Ureinwohner Costa Ricas, 54–57, 98–108, 233–239, 259–271. See Alfredo González Chaves and Fernando González Vásquez, La casa cósmica talamanqueña y sus simbolismos (San José: Editorial Estatal a Distancia, 2000 [1st ed. : San José: Editorial de la Universidad de Costa Rica, 1989]), 143–161, and Tochtermann, Die Architektur der Ureinwohner Costa Ricas, 54–57, 259–271. González Chaves and González Vásquez, La casa cósmica talamanqueña y sus simbolismos, Figura 24: Concepción genérica del mundo, según interpretación de las historias bribris, 146. Gerardo Reichel-Dolmatoff, “Los Kogis Colombia,” in: Pueblos de la Tierra, Amazonas y Pampas, Los Andes (Barcelona: Montaner and Simón Editores, 1978), 153. Interview with Alí García Segura (Bribri and professor for Bribri studies), San José, July 13, 2017; my translation. Tochtermann, Die Architektur der Ureinwohner Costa Ricas, 58–61, 130–131. Tochtermann, Die Architektur der Ureinwohner Costa Ricas, 125. Bal, Travelling Concepts in the Humanities, 97. Tochtermann, Die Architektur der Ureinwohner Costa Ricas, 111, 131, 161. Tochtermann, Die Architektur der Ureinwohner Costa Ricas, 288. Tochtermann, Die Architektur der Ureinwohner Costa Ricas, 151. Karl Sapper, Viajes a varias partes de la República de Costa Rica 1899 y 1924 (San José: Biblioteca Patria VI, 1943), 84–85. Bal, Travelling Concepts in the Humanities, 174–176. Tochtermann, Die Architektur der Ureinwohner Costa Ricas, 242. Bal, Travelling Concepts in the Humanities, 253–255. Ileana Vives, “Una arquitectura para el cambio,” in Historia de la arquitectura de Costa Rica, eds. Elizabeth Fonseca and José Enrique Garnier (San José: Editorial Universidad de Costa Rica, 1998), 383–422, here: 415. Graham Harman, “Philosophy and Architecture,” 2. Wiener Doktorand_innen Symposium der Architektur, Vienna, September 27, 2017.